What is The Scots Magazine digital edition? 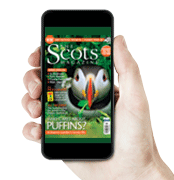 A Scots Magazine digital subscription lets you read each issue of The Scots Magazine on your desktop, Apple or Android device. It’s the world’s oldest magazine, first published in 1739; the leading Scottish interest publication showcasing the best of Scotland’s people, outdoors, wildlife, and history. How do I access The Scots Magazine digital edition? How do I download The Scots Magazine digital edition apps? 1. Locate the App Store icon and tap once. In the search field at the top right, type “The Scots Magazine”. 5. When the app has installed, the button will say OPEN. Tap this to open the The Scots Magazine app. 6. Once the app is open, tap on any issue to log in to the app with the same details as your online subscription. We advise you purchase subscriptions via the subscription page and access the app via the Subscriber Management log in box. 1. In your Kindle Fire home screen, type “The Scots Magazine” into the search field at the top. 1. Go to the Google Play store. In the search field, type ‘The Scots Magazine’. 2. From within the search results, tap on the The Scots Magazine icon followed by the green INSTALL button. 3. An ‘App permissions’ panel will appear, tap the green ‘ACCEPT’ button to start the installation of the The Scots Magazine app. 4. Now tap on the ‘OPEN’ button to open the The Scots Magazine app. How much does a subscription to The Scots Magazine digital edition cost? A subscription grants access to the digital editions for a period of 3 months, 6 months or a year. Is there an alternative way to download The Scots Magazine digital edition? You can also download and purchase a subscription for The Scots Magazine digital edition solely via the apps. To do so, tap on the download button under each issue. You can now turn off your Wi-Fi and access issues offline by tapping on the ‘Downloads’ icon on the bottom bar.